This simple and easy Carrot Cake recipe is dare I say it, the BEST! It is moist and tender and filled with the perfect amount of spice. 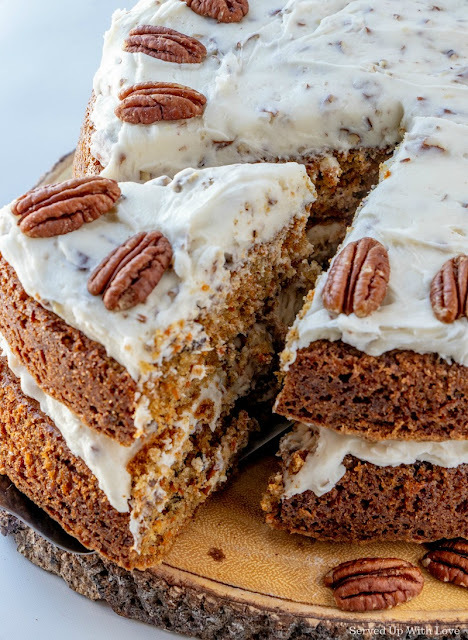 It's then topped with a creamy, cream cheese frosting that is studded with pecan bits. What makes this cake just a little bit different is the frosting. It is not fully covered with frosting. It just gives this cake just a little something different. And because it is not fully iced all over, it is not overly sweet with frosting. 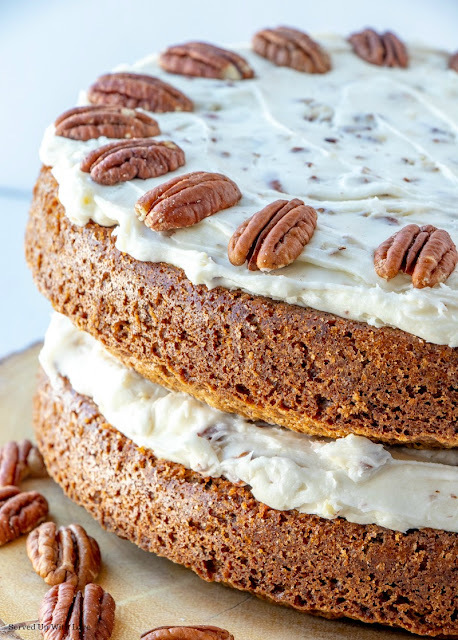 Little bits and pieces of pecans are studded within the icing and then of course because we could never have too many pecans. We top whole pecans all over the edge of the top. It certainly is a show stopper dessert. 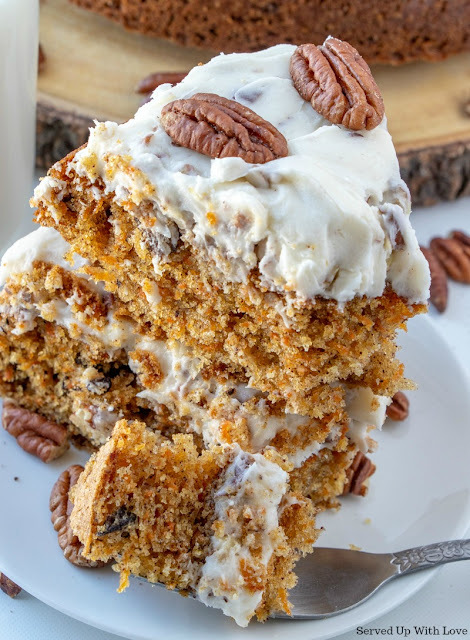 Cream Cheese Frosting and Carrot Cake go together like life long best friends. I promise this icing is super easy to whip up and if you decide you would rather frost the entire cake, just double the icing. And if you have any left over, it is totally ok to eat it with a spoon, I won't judge! My family is not a fan of cream cheese. So whenever I bring a dish to any family gathering I have to make sure it doesn't include any cream cheese. If your family is also not a fan of cream cheese, you can always use homemade vanilla buttercream frosting in place of the cream cheese icing. This carrot cake is the perfect spring time dessert perfect for your Easter dessert table. Need more ideas for the dessert table? Pineapple Sunshine Cake and Pineapple Coconut Cake are just what you are looking for. 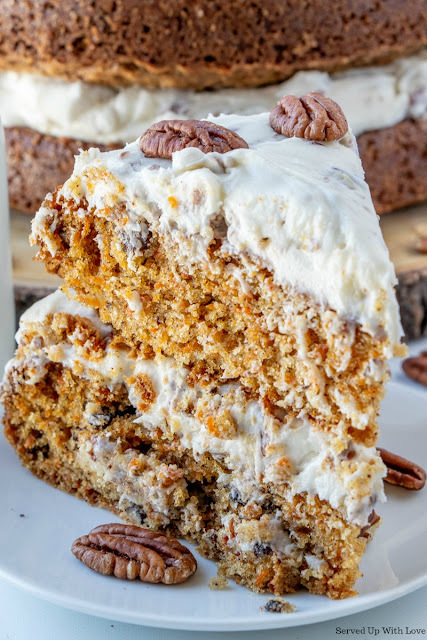 The Best Carrot Cake is perfectly moist and tender and filled with the perfect amount of spice. 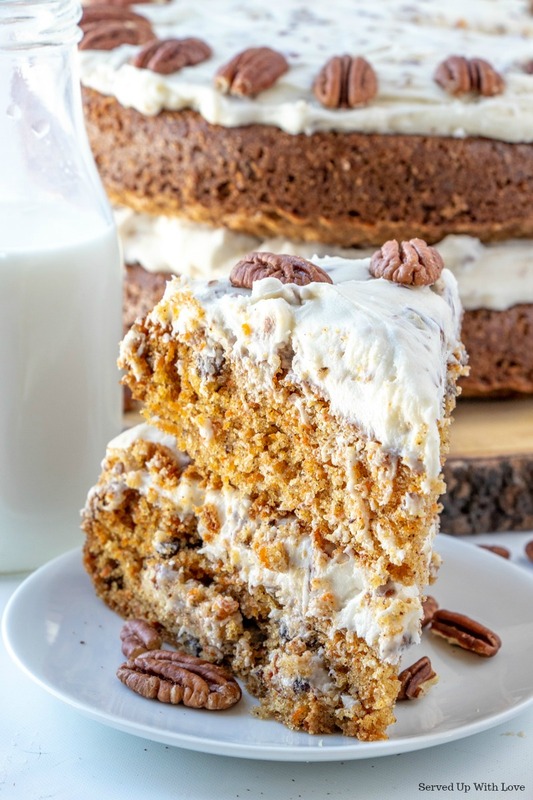 It's then topped with a creamy, cream cheese frosting that is studded with pecan bits. A show stopper dessert! Preheat oven to 350 degrees F. Grease and flour a 9x13 inch pan. I used two 9 inch round pans. In a large bowl, beat together eggs, oil, white sugar and 2 teaspoons vanilla. Mix in flour, baking soda, baking powder, salt and cinnamon. Stir in carrots. Fold in pecans. Pour into prepared pan. Bake in the preheated oven for 40 to 50 minutes, or until a toothpick inserted into the center of the cake comes out clean. Let cool in pan for 10 minutes, then turn out onto a wire rack and cool completely. To Make Icing: In a medium bowl, combine butter, cream cheese, confectioners' sugar and 1 teaspoon vanilla. Beat until the mixture is smooth and creamy. Stir in chopped pecans. Frost the cooled cake. This looks like a fantastic recipe! Great photo too.